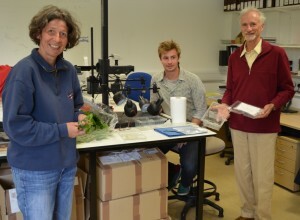 On Monday and Tuesday this week we were lucky enough to have a visit from Dr Roger Cook, co-author of ‘Taxonomic manual of the Erysiphales (powdery mildews) ISBN-13: 9789070351892’ – the definitive work on taxonomy of this economically important group of plant pathogens. 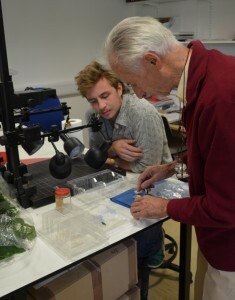 Roger was visiting to help train Oli Ellingham in techniques for culturing and studying powdery mildews. The RHS Advisory Service receive many powdery mildew specimens each year and this project, jointly supervised by Beatrice Henricot aims to develop improved diagnostic tools for this difficult group of fungi. 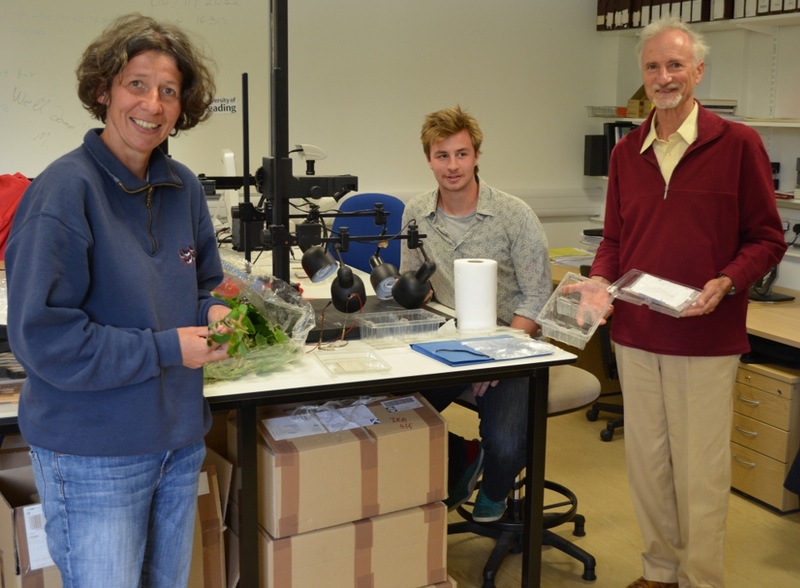 Beatrice Henricot, Roger Coook and Oli Ellingham in the lab with a collectuion of powdery mildew samples collected at RHS Wisley and Reading University Harris Garden. Roger Cook demonstrates his method for innoculation and growth of powdery mildews in single leaves. The two days comprised a mixture of lectures from Roger, a survey of our Harris Garden for powdery mildew specimens, microscopy and demonstrations of leaf assay set-up. Oli is now working at full speed to use his new knowledge and make the best of mildew season. Powdery mildew was found on a range of plants in the Harris Garden: Sonchus sp., Malus spp., Fagus sylvatica, Epilobium spp., Acer spp., Quercus robur, Quercus x rosacea, among others. Oli is surveying the campus regularly and building up a record of which plants are found with powdery mildews on them. This entry was posted in PhD research, RHS research and tagged Beatrice Henricot, Erysiphales, Leaf assays, Oli Ellingham, Powdery Mildew, Roger Cook. Bookmark the permalink.